1. Leave Washington Union Station at 11:55 AM on Amtrak 176. Arrive New York Penn Station at 3:17 PM (226 miles). 3. 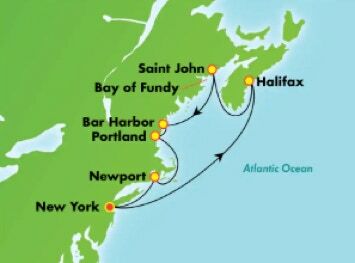 Leave New York City at 4 PM on Norwegian Cruise Lines Royal Dawn for Halifax, Canada. 5. Arrive Halifax at 9 AM. Celebrate the country with a range of pure Canadian experiences that includes visiting early settlements and landmarks and shopping for Canadian delicacies. After departing from the pier, settle in for a circuitous, picturesque drive through Halifax, admiring historic sites such as the Halifax Citadel, where the British built a fort and founded the town, and the Province House, Canada’s oldest legislative building. Along the way, hear fascinating stories about Halifax’s history, the Royal Canadian Mounted Police and why Nova Scotia sends Boston a spruce tree every Christmas. Continuing on, the tour arrives at another extraordinarily scenic area, Old Town Lunenburg. Established in 1753, it is North America’s best surviving example of a planned British colonial settlement. The original layout and appearance has been retained so faithfully that UNESCO designated Lunenburg a World Heritage site. During free time, explore the brightly colored Old Town, which is easy to navigate because the streets follow a rectangular grid pattern designed in Britain. Expect to see 18th-century wooden buildings and perhaps a replica of the Bluenose, Canada’s legendary racing ship that was launched here in 1921. Later, in lovely Mahone Bay, shop or dine, prior to visiting Acadian Maple. This family-owned business sells all sorts of Canadian delicacies, many made with maple syrup. Before returning to the pier, more free time awaits in Peggy’s Cove, a quaint fishing community with one of the country’s most photographed lighthouses. Depart Halifax at 6 PM. 6. Arrive Saint John-Bay of Fundy at 11 AM. Led by a professional photographer, today’s tour provides tips and techniques on photography while shooting some of the most iconic images of New Brunswick, including a Bay of Fundy beach, a working fishing wharf, waterfalls, and more! This coastal adventure also includes a photo stop at renowned Reversing Falls Rapids, where the mighty Bay of Fundy causes the Saint John River to reverse direction twice every day and flow upstream! This excursion goes off the beaten path and along the coast to enjoy the scenic beauty of New Brunswick. Depart Saint John at 7 PM. 7. Arrive Bar Harbor, Maine at 8 AM. There is a great abundance of marine life in the Gulf of Maine. Today’s destination is 20 miles south of Bar Harbor, the feeding grounds of the larger whales. Travel aboard the one of the fastest, largest, most luxurious whale watch catamarans in North America, all equipped with the latest in navigation and communication equipment. The vessel has full galley and bar service, and excellent viewing from all three decks. Stable, fun and propelled by water jets; safe for whales and the environment. Along the way, the crew will point out wildlife sightings such as Harbor porpoise, seals and a great variety of Pelagic seabirds. Offshore, search for pods of Pilot whales and Atlantic white-sided dolphin, sharks such as basking, blue and Mako and schools of Bluefin tuna. Commonly encountered are Humpbacks, Finbacks and Minke whales and occasionally, Northern Right whales. The naturalist will describe each whale’s behavior, adaptation to life in the ocean and conservation issues affecting their survival. Depart Bar Harbor at 6 PM. 8. Arrive Portland, Maine at 8 AM. Nestled in the old port district of Portland is the bustling working waterfront where lobstermen off-load their catch from Casco Bay and seafood shops offer the freshest delicacies from the sea. Discover the inner workings of the area with a voyage on a lobster boat followed by walking tour through the cobbled streets of the area exploring the numerous marine related businesses. From the pier a short walk leads to the waterfront departure point of a lobster boat. Following a short safety briefing, depart to Casco Bay to pull live traps. During the voyage discover how lobsters get from the bottom of the ocean to the dinner plate and learn about their habits, conservation efforts and the difference between hard shells, shedders, shorts, culls and keepers. 9. Arrive Newport, Rhode Island at 11 AM. Newport is as famous for its coastal beauty, as it is for its architectural magnificence. Enjoy both on this tour that combines a spectacular stroll along the Cliff Walk trail with a visit to The Breakers, one of Bellevue Avenue’s most spectacular mansions. Begin with a nature walk along Newport’s famous cliff walk, resplendent with wildflowers, colorful birds, and interesting geology. This 1 1/4 mile stretch goes on a path that runs between the rocky coastline and the “backyards” of many of Bellevue Avenue’s palatial cottages. On the walk, the guide will share the stories of America's "gilded age" and the cast of characters that made Newport one of the nation's wealthiest summer resorts. The walk will conclude at The Breakers (sometimes due to congestion, the walk will begin after touring the mansion). From the 1870s to the 1920s, the Vanderbilts were one of America’s most affluent families and commissioned the most prestigious and expensive architectural firms to build a series of homes for them along the East Coast. In Newport, these homes, amusingly called “cottages,” are unparalleled in historic significance and beauty. Built during the period known as the “gilded age,” they’re now National Historic Landmarks. The Breakers is considered the grandest of all of the Newport summer cottages. Designed by architect Richard Morris Hunt for Cornelius Vanderbilt II, this Italian Renaissance palace was completed in 1892 in less than three years at a cost of approximately $11 million, which would be over $200 million today! Originally constructed in France and reassembled here, the Grand Hall boasts 50 foot ceilings and has the largest room of any Newport mansion. Depart Newport at 6 PM. 10. Arrive New York City at 8 AM and disembark. Depart New York Penn Station at 11:05 AM on Amtrak 195. Arrive Washington Union Station at 2:28 PM (226 miles).